The City of New York has implemented the following street closures, parking rule changes and restrictions for vehicular and pedestrian traffic in preparation for the September 11 commemoration at Zuccotti Park (south of One Liberty Plaza at Liberty Street between Broadway and Church Street/Trinity Place). The commemoration for family members will take place on Saturday, September 11 from 6:30 AM to until late afternoon. Following a moment of silence at 8:46 AM, the names of the victims will be read with music as a backdrop throughout the program. There will be additional moments of silence at 9:03 AM, 9:59 AM and 10:28 AM. 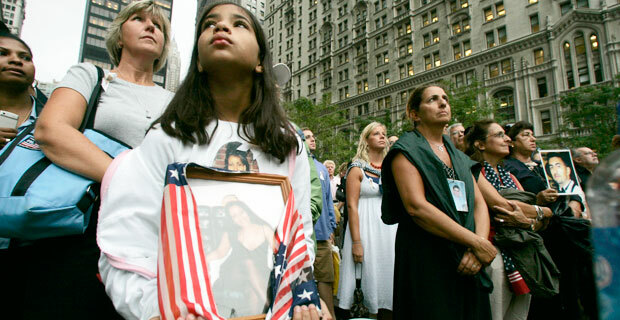 During the ceremony, families will be allowed to visit the WTC site. The Tribute in Light, originating at the Battery Garage, will begin at sundown. Avoid scheduling deliveries on September 11 until after 5 PM. Use public transportation whenever possible to stations outside the event area. Minimize car-service pickups on September 11 until after 5 PM. Traffic along Broadway and West Street is expected to be heavy. Zuccotti Park will be closed in part starting at 7 PM Tuesday, September 7. It will be completely closed on Saturday, September 11 and will reopen on Sunday, September 12. The Greenmarket in Zuccotti Park will be open on Tuesday, September 7 as scheduled. Vendors will not be allowed to operate in the park on Saturday, September 11. The R train station at Cortlandt and Church streets will be closed the evening of Friday, September 10 and on Saturday, September 11. Liberty Street between Broadway and Church Street/Trinity Place will be closed to vehicles, parking and traffic from 7 PM Tuesday, September 7 to 11:59 PM Saturday, September 11. Pedestrian access will be very limited. 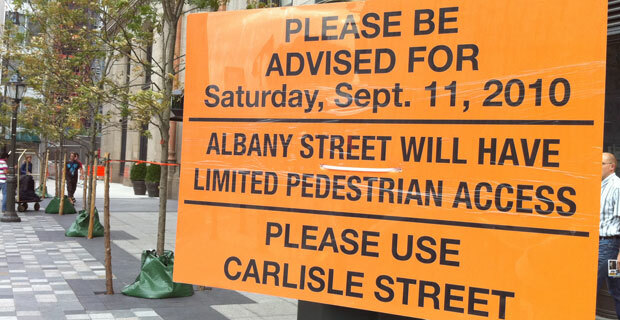 There will be no pedestrian access on Saturday, September 11. Liberty Street between Broadway and Nassau Street will be closed to parking from 12:01 AM to 5 PM on Saturday, September 11. The Liberty Street Pedestrian Bridge will be closed from 12:01 AM to 11:59 PM on Saturday, September 11. To cross West Street, pedestrians will be directed to use the Vesey Street Pedestrian Bridge or go south to cross at street level at Albany and Carlisle streets. Albany Street between Greenwich and West streets will be closed to vehicles, parking and traffic from 9 PM Friday, September 10 to 11:59 PM Saturday, September 11. Pedestrian access will be very limited. Carlisle Street between Greenwich and West streets will be closed to vehicles, parking and traffic from 9 PM Friday, September 10 to 11:59 PM Saturday, September 11. The street will be open for pedestrians only. Thames Street between Broadway and Greenwich Street will be closed to vehicles, parking and traffic from 9 PM Friday, September 10 to 11:59 PM Saturday, September 11. The street will be used for pedestrians only. Cedar Street between Broadway and Church/Trinity Place will be closed to vehicles, parking and traffic from 12:01 AM Thursday, September 9 to 11:59 PM Saturday, September 11. Pedestrian access will be very limited. Cedar Street between Broadway and Nassau Street will be closed to parking from 12:01 AM to 5 PM on Saturday, September 11. Church Street/Trinity Place between Battery Place and Dey Street will be closed to vehicles, parking and traffic from 12:01 AM to 5 PM Saturday, September 11. Traffic will be diverted to West Street. Pedestrian access will be very limited. Church Street between Chambers and Warren streets will be closed to parking. Cortlandt Street between Broadway and Church Street will be closed to parking from 7 PM Tuesday, September 7 to 11:59 PM Saturday, September 11. It will be closed to all vehicles, parking and traffic from 12:01 AM to 5 PM on Saturday, September 11. Pedestrian access will be very limited. Dey Street between Broadway and Church will be closed to vehicles, parking and traffic from 12:01 AM to 5 PM on Saturday, September 11. Pedestrian access will be open. Fulton Street between Broadway and Church will be closed to parking from 12:01 AM to 5 PM on Saturday, September 11. Pedestrian and vehicle access will be open. Barclay Street between Broadway and West Street will be closed to parking from 12:01 AM to 5 PM on Saturday, September 11. Pedestrian and vehicle access will be open. Murray Street from West to Church streets, Greenwich Street from Chambers to Barclay streets, Â Park Place from West Broadway to Greenwich Street and West Broadway from Warren to Barclay streets will be closed to parking on Saturday, September 11. Pedestrian access will be open. Warren Street between West Street and Broadway will remain open to vehicles, traffic and pedestrians on Saturday, September 11. However, no parking will be in effect. No parking will be in effect on all closed streetâ€”including official permit parking. All cars parked illegally will be towed. Note that West Street and Broadway will be the prime uptown and downtown traffic thoroughfares from 12:01 AM to 5 PM on Saturday, September 11. Please allow enough time for travel. If you have questions, please call 311 or visit www.nyc.gov. OpEd: To Stay or To Go? The 9/11 Conundrum. Every year, the thought of September 11th, leaves me a little stunned. Stunned in the sense that I’m a little too reluctant to leave my apartment to deal with the deluge of news trucks parked in our neighborhood, the restrictions and the reading of the names. A little unwilling to be around a television from 8:45 AM for exactly 102 minutes. Every year, I expect the Red Cross to be around the corner handing out small facial tissue packages to wipe away public tears. The Red Cross is long gone, but the ritual has remained. Although I am for the reading of the all of the victim’s name catharsis for 9/11 families — it still stings a bit much for me to endure all the names. The air in our area can be a gloriously crisp autumn day, but the air is always heavy. The visual cues of the news trucks, the bagpipes, and the sounds from the loudspeakers transport me to yesterday. It can be a bit overwhelming sometimes. The environment and landscape in which we have bred this kind of grieving is quickly changing. In a few years, we will no longer have the construction site or the former Deutsche Bank building as a reminder of the injustice and terror will be long gone. What will happen to the rituals? Should they continue as they have for the past 9 years? Or will they evolve? I was surprised after reading some status’ on our Facebook page, that some of you share these same sentiments. Unsure if it’s right to escape the neighborhood or stay. It’s definitely food for thought and would love to know yours as we approach the anniversary of 9/11.